In March of 2018 I introduced a series called “Friday Flashback” that featured a weekly revisit of some past outdoor adventures. It ran for 35 consecutive Fridays before wrapping up in November. Same concept as we take a stroll down Memory Lane while looking back in increments of five years. From now through November, every Friday will feature pics and words from 1984 or 1989 or 1994 or 1999 or…on up to 2014. All told, just over 40 mostly fishing related posts to kick off your weekend and perhaps inspire you to grab your gear and go. And the 2019 version is going to take it up a notch from last year’s initial run that featured over 175 photos, more than a dozen guest appearances, two dozen fishing holes, lots of lures and close to 400 bass reeled in along with several other species. 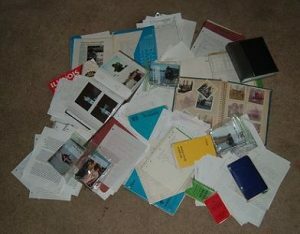 You never know what else may crop up and sometimes neither do I as none of the posts are yet composed, only a pile of notes (both mental and physical) and a date on the calendar. It all begins next Friday with an icy blast from the past which is certainly a fitting start during what has been an ugly and lately dangerously cold winter in my neck of the woods. Back for a second year with a batch of silliness via a collection of clips compiled throughout 2018. Got a little help from my boys with a slip from Zac and more than a few contributions from Jayce. Don’t know that anything would qualify to win us some cash on the funny video show but good outdoor memories nonetheless. All the more rewarding too, considering were headed for a temperature of -27F to start the final day of January. Not really good for outdoor activities so I get my fix as some sort of internet rambler. Day 10 of the video recap series has arrived as promised. Since we started this project with a montage of intro clips, it seems fitting to end it with a batch of recap bits. A look at the part of the trip that comes on the heels of the preparation, the anticipation and the on the water execution. A time when the dust has settled, the gear has been packed up and an angler’s thoughts turn to evaluation (and a sandwich). With an hour drive home from most of my favorite fishing holes it leaves ample time to rehash those best laid plans to ponder what worked and what didn’t. Most of the time there’s a little of both to consider, all to the welcome soundtrack found on the presets of the truck radio. Weather, lures, water conditions, trip duration and number of bass caught are among the standard topics in a recap. In addition, there’s the general summary of the ups and downs that come during a day on the water while enjoying the entertaining and dynamic hobby called fishing. All of the above are included below in the 2018 Fishing Video Recap of the recaps. There you have it, the finale of a Top 10 sort of video recap from the year that was. I hope you found something worthwhile in the clips whether it was entertainment, education or simply an escape from what you should really be doing instead of hanging out on the internet. Back in 2014 on a former blogging gig I kicked off an audience participation thing called “Top 5.” It all began with bass and basically you send in your catches as the year progresses working towards a year end Top 5 weight. I’ve covered all of the specifics here on the website a couple times, most recently in the January 7 Top 5 Update post so I’ll refer you there for the scoop. For 2018, 116 more bass entered the database thanks to anglers both young and not as young, waters both public and private and lures galore. It’s always a treat to see a new message in the Inbox, catch one for myself or have a front row seat when a fishing partner gets a good one. And the latter is where we are headed with today’s video. All of the 2019 bass had their merits so how in the world would a guy pick a Top 5 from the Top 5 to call his favorites. Actually, it was pretty easy. And they ain’t even mine. Yep, it was quite a day. Chunking Senkos on Cinco de Mayo with my boy. Don’t get much better than that. I’ll leave it at that too, as the video says plenty. You don’t need any more words from this guy, just go back and watch the video instead. So, this whole series comes courtesy of my recent foray into the world of video technology via GoPro or iPhone. Neither of which actually existed back when I started writing outdoor articles. The new wrinkle of being able to include some video with the words and pictures has been a pretty cool addition that I find quite entertaining. And entertainment is a lot of what the last 17 years and 1363 postings has been all about. I must say that a fair amount of all of that stuff has primarily entertained one person more than the rest. That would be the guy who composed it. Today’s clip is a perfect example of how the video aspect has added to my entertainment while enhancing the fishing and writing experience. What we’ve got here is a 12” bass that tipped the scales at one pound even and was caught at Lost Grove Lake on July 27, 2018 using a buzzbait. It says so right there in my log book. Standard issue recording of a catch, similar to the four hundred or so other 12” bass in there, nothing particularly noteworthy, right? Well, throw in a little video of the catch and it turns out that there is more that meets the eye. Take a look for yourself before I delve into the details. Let’s start with a classic summer evening buzzbait scenario as you run the bait along the outside weed edge of an expansive shallow, weedy flat. Keeps you right on the edge of your seat. Watch and listen again at the 0:12 mark as the bait briefly hangs in some weeds, skips a beat and accelerates forward as I give it a twitch to pull it loose. You know what happens in the next split second. Classic bite after a lure has banged into an object and darted free. At 0:16 the thrashing bass hits the edge of the duckweed surface cover and carves a path through the mat on the way to the boat. By 0:31 the duckweed has regained complete surface coverage which is kind of cool to watch. It’s a neat example of something that I never really paid any attention to as my eyes and attention focus intently on the catch. Of course, the video also comes with audio and it is fun to listen to whatever thoughts and details are presented as the catch proceeds. Yet again, aspects that would be lost to time without some cool pieces of technology that easily fit in your pocket (or tacklebox) or strap around your chest. As I said, perhaps I primarily amuse myself but I’d like to think that there are some fellow anglers out there who can relate. After all, I suspect there’s more folks reeling in their share of run of the mill bass in between the occasional and often elusive lunker than there are certified big bass slayers. I would guess that a lot more fishing resembles this video than it does a magazine cover. To finish up today’s submission I’ve included a bonus video that I figure a few can relate to as well. It was a bit too much to include on my already full blooper video for later this week. But since it features some more Lost Grove Lake footage it fits in here just fine. Anybody’s mother-in-law ever bought ‘em a dipnet? Just thought that I’d throw that out there because mine just did this past Christmas. Could’ve used it on this bass from last April as I’m not as eager (or brave) as I used to be when reaching down to lip a mouth full of treble hooks. Instead, I’ve taken to using a Boga Grip and while some may question the tool for landing fish that will have to be a debate for another day. Besides, I’ve taken to packing along the dipnet to start 2019. Never even got a bite to try it out. Of course, I’ll blame it on the frigid and uncommon open water during the first week of January as opposed to the tool being some sort of jinx. However, come spring if I’m still getting shut out, well, I’m headed for Quincy, IL to say “thanks but no thanks.” I believe it will all work out just fine though. Today’s clip features a catch that had me wondering if it would work out fine as that bass was sure thrashing about trying to dislodge my crankbait. In addition, I’d had a less than stellar day and confidence really wasn’t riding high that this one was going to stay hooked. In fact, I was struggling so much that I didn’t even have my GoPro turned on when I hooked into this bass. Instead, I performed the ill-advised trick of pushing the “Go” button as I was fighting the fish in a desperate attempt to get some footage. Luck was on my side and I was able to shoot this video of what would be my third largest bass of the year. So what about the footage of my Top 2? Well, there is no such video as my GoPro was experiencing technical difficulties during a September outing when those bass were caught along with a five-pounder caught by my brother, Brent. Just bad timing as good, old photographic evidence had to suffice. A couple other big bass that I witnessed also eluded video documentation while fishing with Brent. Not that he forbade me to film his prowess, more like a couple items called TMI and NEB. TMI = Too Much Information – there are some spots I prefer not to film or reveal. NEB = Not Enough Battery – can only shoot about 75 minutes with current GoPro setup. You know all of that stuff that you learned during your formal education that you never really get to use? Well, a blog can do wonders for bringing some of that good, old useless knowledge to the surface as one ponders a post. “PB” was always a fun bit of trivia when it came to the Periodic Table of Elements as it strangely represented the abbreviation for lead. But, if you were a fellow with two years of high school Latin and two more semesters in college, well, it made perfect sense. Lead is plumbum, of course. (Shout out to Mrs. Buck and Professor Vander Muelen) And sticking to Latin and Chemistry, as for the “J” in today’s title, there is no J in Latin thus not surprising that the letter does not appear in the Periodic Table. Okay, enough showing off as the acronym, “PB”, stands for “Personal Best” and can be applied in a number of pursuits, generally in athletics. 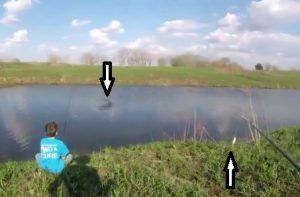 Today it is being used in the world of bass fishing and pertains to the fish landed in the video below by my boy, Jayce, on Cinco de Mayo. Obviously, I dig this video as it is not only an admirable catch but it also brings to mind a couple other thoughts as I watch it again. I’ve marked these items with arrows in the snapshot below taken from the video right as Jayce’s Senko splashed down. First up, I nearly blurted out that I didn’t think Jayce’s cast was long enough to fool a fish. Luckily, the bass struck immediately and saved me from the documented embarrassment of not minding my own business and just letting the boy fish without unnecessarily critiquing such details. He got it in the water which means he got it right. The second item concerns the lure on the end of my pole at the lower right of the pic. For what it’s worth, it’s a Whopper Plopper as I was dinking around hoping to show Jayce the thrilling blast of a topwater strike. After Jayce’s catch I put it away and stuck to observing and filming in between some bluegill casts. As I watched and listened to his increasing confidence I knew that it was not the time to risk lucking into a bass that would possibly knock him off of the Top Bass throne. It was his day and he was putting on a good show, he didn’t need a cameo from some old wannabe bass fisherman. If you’ve hung around the website for a bit you are familiar with the fondness that I have for rock and pop music. With fifty years or so of tunes bouncing around in my brain, I pretty much have a lyric for every situation. As such it is commonplace for me to find that the media player in my head is playing a tune that reflects the conditions, the day’s events or my general state of mind. For 2019 there were several instances when The Association’s “Windy” was on repeat as the weather conditions seemed like a broken record. When rowing around the strip mines I had to put the anchor to frequent use. While prowling on foot I found myself pummeled by ash from a recent controlled burn and even washed by spray off of the water during an extremely blustery day. Those conditions really do a number on my rather basic video/audio setup as they ruin the sound and really make it rather unbearable to view without some editing work. But for this post I’ve left it as is so you can get a bit of a feel, minus the potential windchill effect though. Of course, there are two sides to every story and as fellow anglers know, wind can also be your friend. It can help to position the bass and sometimes get them stacked up pretty good on a solid structural element when the wind hits it just right. As proof, one of the trips in the clips was a solo April outing that produced 60 bass in six hours of hiking. I have scoured the internet on several occasions in search of an old advertisement that offered up the tagline “there’s big fish in Iowa” or something quite similar. I want to say that it was a tourism spot but could very well have been pitching a product of some sort. What I do know is that I’ve had some difficulty finding those big fish so it is not only the advertisement search that has proven elusive. I’ve only been fishing Iowa waters since June 2016 and exclusively on the relatively new Lost Grove Lake so my attempts have been rather limited. To date, my personal best Iowa bass is a 2-3 from June 2017 among the 106 bass in the log from just under 40 hours of casting in The Hawkeye State. The clip below represents the Top Iowa Bass for 2018, not a particularly impressive specimen but worthy of a video highlight nonetheless. Even though I have yet to fool anything real special on Lost Grove, I still plan on giving it another shot in 2019. The proximity of a 25-minute drive makes it a good after work weekday trip once the summer days get long. A couple evening hours hits the spot and I do know that some good ones do indeed prowl that water. I’ve seen a couple on internet reports as well as several firsthand swimming in the waters. But the toughest one to take was a 4-pounder that a fellow nabbed from the bank within a cast of my boat and right where I was headed. Tough luck for me as he simply got there first. Initially a little bummed, I took a mental step back, congratulated him on the catch and even assisted him by loaning my pliers and snapping a couple pics for him with his phone. There’s an interesting bunch of young YouTubers out there on the internet doing the fishing thing and I must admit that I do get a kick out of their ambition and some of their antics. However, I still cringe a bit when one of them drops some profanity as I am sure there are kids who follow as well, including some of mine. Now, I know that my kids hear worse more often at school and they tell me so. It is what it is and I simply inform them that I don’t want to hear or hear of them using such language. All good, right? Until this video clip from my nine year old boy, Jayce. Okay, all in good fun, I can live with “Holy crap”, could be another synonym. Overall, it’s just plain fun to see a kid take a liking to a hobby that has provided me with so many memories for so many years before he was even around and hopefully will keep on giving as he/we grow older. Lots of stuff going on here, far too much to write about in detail and perhaps hard to put into words anyway. Things as simple as fresh air, ditching technology (well, except for a phone that records video) and father-son time all fit nicely into that “priceless” category. As far as that boy’s language goes, there’s that old saying that “the apple don’t fall far from the tree.” Thank goodness that most of what’s in my head some days stays there instead of coming out of my mouth. Seems that the old adage also applies in respect to that boy being a fisherman.